2015 update: To mark the 10th anniversary of the Sue C. Boynton Poetry Contest, a second anthology of winning poems has been published, with cover art © Copyright 2015 by Kim Wulfestieg. Special thanks to WECU for underwriting the first print run. A celebratory reading of selected works from the collection will be held at Village Books on Thursday, September 17, 2015, at 7:00pm. Copies will be available for purchase at the reading and through Village Books. Additional details and purchase information will be posted as soon as it is available. 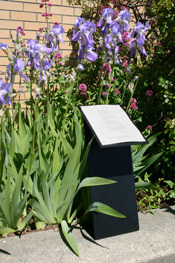 The 5th annual Sue C. Boynton Poetry Contest, in 2010, culminated with the publication of POETRY WALK: Sue C. Boynton Poetry Contest — The First Five Years. Edited by Nancy Canyon and Anita K. Boyle, and designed and illustrated by Nancy Canyon, the 152-page collection includes the full text of all winning poems from 2006 through 2010. “This is true community poetry, showcasing the thoughts, feelings and perceptions of local residents, diverse in their experiences but all sharing a talent for expression.” From the Introduction by contest committee chair, Luther Allen. For library users, four copies of POETRY WALK are now circulating (3 in Bellingham, 1 in Deming). Search for the title POETRY WALK in the online catalog or search the author field for Nancy Canyon or Anita K. Boyle (editors). A circulating copy is available in the Western Washington University open collection and a non-circulating copy has been donated to Special Collections at WWU Wilson Library. POETRY WALK was the number-one-selling poetry book for all of 2010 at Village Books!